Why title it IMMODESTY? Simply because we need to UNDERSTAND Immodesty first to understand what REAL CATHOLIC MODESTY IS. When I first wrote this book in 1999, I had no idea it would reach where it would. At the time there were NO books on modesty for Catholics in print. Except for "Immodest Dress", a small booklet at the time, there was no one resource that brought everything together. Once I made the JUMP to modest dress myself in 1997, through all the obstacles I just wanted to SHARE what I discovered. My heart was just so FILLED with peace and joy that I wanted to SHARE with others. 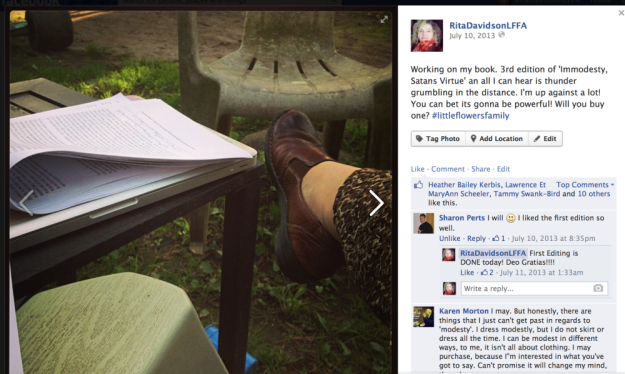 A religious friend we had at the time said, "Why don't you write a book on modesty?" What ME? I thought? I have no journalism or english degree (well look at all my spelling mistakes eh?) . So I prayed about it and suddenly in I started getting papers, booklets, papers sent to me on Church teachings about modesty. So, Ash Wednesday 1999, I began to write. The book was completed by Easter Sunday that same year. 40 days. It took another 2 years and 9 editing's to see this book in print. By that time I started a support group on yahoo to help others. Over the years I have helped hundreds of families on there and by phone how to make modesty work for their families. What works for one does not always work for another. Fast Forward to today, 16 years later. A-LOT sure has happened in 16 years. We paid the heaviest price when we lost our older children from the faith and broke our hearts. 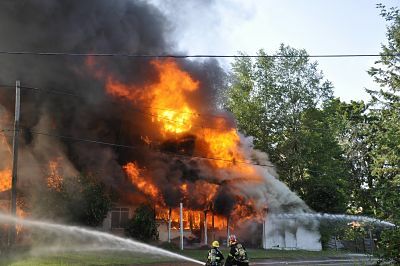 Then in 2013, we paid another heavy toll by when we lost our home in a devastating fire that burned our home, van, business and memories to the ground. In an instant we were homeless for 6 months with no running water, or indoor toilets. Cast iron and glass melted we could not believe the charcoal 6 feet deep in places. 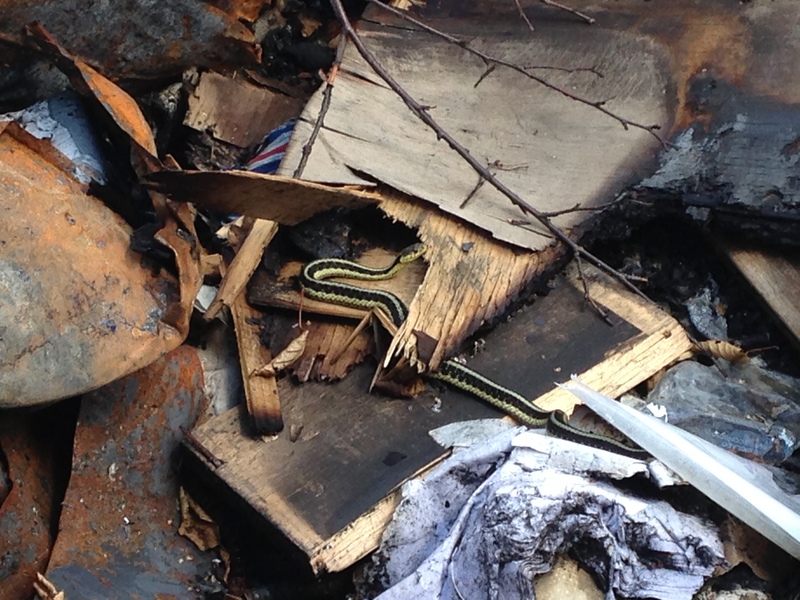 LO and BEHOLD on the first day we visited the ruins, coming UP from the rubble was a SNAKE! I instinctively said, "It WAS you!" Knowing in my heart of hearts that Satan was behind this devastating fire trying to take away not only our home, but our work for souls. We had just THREE days to dig. But on the third day, so tired and overwhelmed from the blackness, a DRAMATIC discovery was made. After a dramatic display of color, under all this charcoal and wood THIS BOOK, "Immodesty, Satan's Virtue" was found INTACT. Now this was a clear message to me that I MUST get this book back into print. You see I was editing this book RIGHT before our fire. I even posted it on my Facebook page, just 9 DAYS before our house fire. As I sat there with the editing finished I could hear THUNDER in the distance. I wondered what trouble that might mean for my book then. I now see, that we nearly lost our LIVES that day in our fire. We had just 10 minutes to spare to get out of that burning house from our sleep. Smoke was already above our heads. It was a miracle we got out alive. It was a BIGGER miracle that this book SURVIVED. The real question is, if GLASS can melt, WHO or HOW did this PAPERBACK BOOK survive? AND WHO made it survive and for WHAT PURPOSE? Those are all questions I pondered, prayed over while I was TERRIFIED to tell anyone this book SURVIVED until nearly a year later. You see this wasn't the FIRST Time we have encountered this. There was a time back in 1999 when the book was still a manuscript on my computer. We came back home and opened the door to a sulphurous smell throughout our house. We immediately looked and seen my computer was hit and found the manuscript was SCRAMBLED. OPENING it up all I could see is was foreign language - UNREADABLE. BUT the "HAIL MARY" PRAYER that was always in the front of the printed book was UNTOUCHED. It was readable. That was when I knew I was up against principalities and powers. 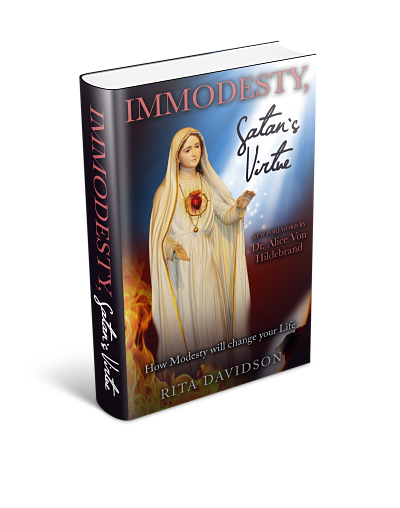 It was then I titled my book, IMMODESTY, SATAN'S VIRTUE, because Satan is the arch enemy of God. While God uses his goodness to increase our virtue, Satan uses the opposite to achieve his ends. SO in Satan's world, Immodesty IS a virtue you see. He is using it to entrap young and old today in a cancer that has enveloped society SO COMPLETELY we can barely find our way out of it. A CHALLENGE to CATHOLIC MOTHERS: It was EVE that caused Adam to fall. It is up to us mothers, to bring sanity BACK to the world. Our Lady of Fatima requested it in 1917, and her warnings were never heeded. Now we are saturated in a society so impure, our children and families are being swallowed up whole. Who am I to write such a book? Well, I was one of those young girls that found myself expecting when I was just 17 years old, much to the disappointment of my Catholic parents. But that is not the only reason I understand this. I myself was brought into this world from un-wed parents. I seen MANY of my own family bring children into the world un-wed. I also became a survivor of sexual abuse by family members. Because modesty went out the window, our family was fractured in a way that it could never heal. Why do I share all this with you? Because I believe this book has the answer. After many years of healing, many years of prayers, months of fighting my own fears, and many years of being a listening ear to other families and counseling them, I wrote THE book, "Immodesty, Satan's Virtue". After 16 long years, I am working to bring this MUCH needed and MUCH requested title back into print for YOU, Catholic Mothers. I so WANT to save your families from the suffering our own family suffered. I so want to give you the SUPPORT you have been needing fighting a battle that leaves you alone in your fight against the world. 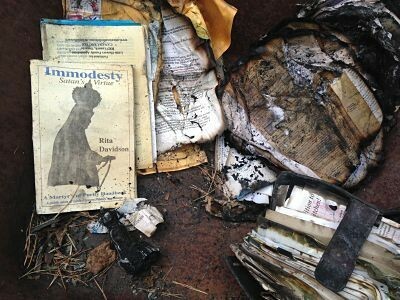 If God has saved this from a raging fire, Can you afford NOT to read it? PART ONE: What Does the Church have to say?, A Conspiracy, Really?, Nakedness and the Purpose of Clothing, The Disappearance of True Womanhood and Modesty, Church Attire, Modesty, What else does it Include?, Headcoverings?, Modesty is for Men too! PART TWO: Questions, Concerns and Practical Tips, Sewing, Temperatures, How to work, play and live in your dresses, A League for Modesty in Dress. A must for every Catholic interested in seeing this issue straight on! Brand new COVER - straight from Fatima & Sr. Lucia's convent! New Expanded Contents - Everything you wanted answered! THANK YOU TO EVERYONE THAT VOTED for the cover! It was a REALLY CLOSE tie, but Our Lady of Fatima won in the end. It really is HER message since she has told us, "the most souls that fall to hell are from sins of the flesh". This ALL NEW EXPANDED EDITION will shock and intrigue you with the new research it brings together. Thought you knew everything about real catholic modesty? Think again. Don't miss out on a book that is guaranteed to change your life!